Private Estate Home With Guest Apartment. This beautiful three bedroom home is located in Moon Valley, an exclusive community located in between Herradura and Jaco Beach. Custom built with a master suite that features a walk-in closet and a unique master bath that includes a jacuzzi bathtub and a separate shower. Open floor plan with spacious living and dining areas and gourmet kitchen fully equipped with top of the line appliances, granite counter tops, custom cabinetry and sit down breakfast bar. 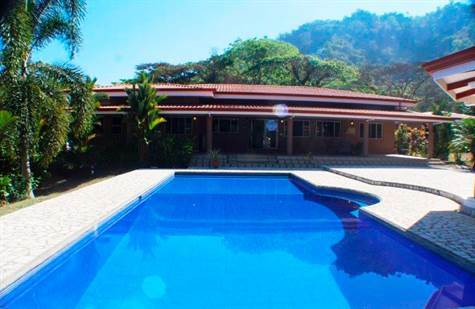 Big Lot with over 1.25 acres of tropically landscaped grounds surrounded by mountains, nature, and wildlife. Yard area includes a covered terrace, a large swimming pool, rancho and a backyard with plenty of room to expand. Garage great for cars or storage area. Property includes a one bedroom guest apartment perfect for live-in help or additional income.